I’ve shot several weddings, portraits and promotional posters; head shots, events, second lines and red-carpet openings; today, though, was the first time anybody ever asked me to shoot a funeral. Pam Folse and Sandra Bohne, along with their brother Mark Folse, decided they wanted some nice portraits of the entire extended family when everyone was together for the funeral of their mother, Elaine. A mutual friend got us in touch, and this morning I carried my camera bag up to the St. Anthony of Padua Catholic Church in Mid-City. Quite frankly, I was a little nervous about the prospect of shooting the attendees at a family funeral service. I don’t even feel comfortable at the weddings of strangers, half the time, let alone the day on which an entire family is mourning the loss of their 91-year old matriarch. Her three surviving children, though, were generous with their sharing, and happy to tell me some of their favorite things about their mother. I asked them what they think of when someone says ‘Elaine’. “Coca-cola,” they each said, practically in unison, and laughed. 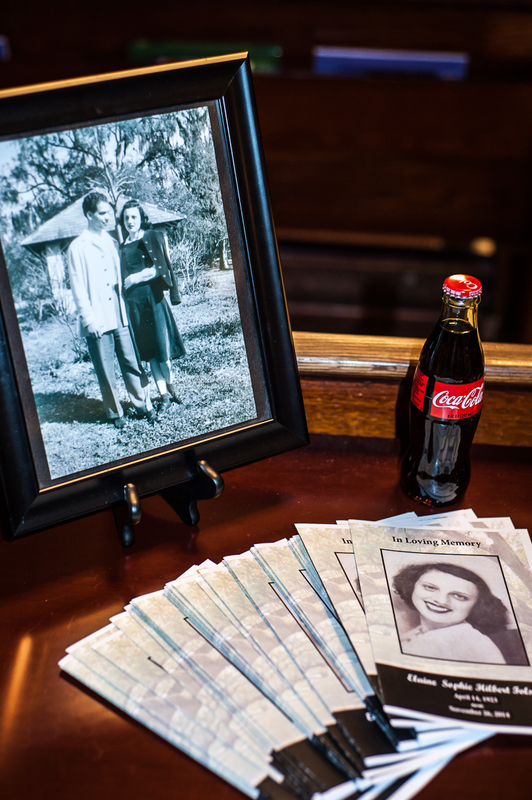 Sandra added, “I have a little bottle of Coca-Cola in there, she was a Coca-Cola drinker.” She was referring to the simple memorial they had set up on a table just inside the church. “Memorial”. St. Anthony of Padua Catholic Church, New Orleans, 12/13/2014. Format: digital via DSLR. “An old-fashioned?” I replied, and then, always thinking like a bartender: “What kind of whiskey?” The answer was immediate. They encouraged me to go inside and take a few pictures of the tributes that had been arranged. There was no coffin or viewing, because Elaine had insisted against it. It was really special for me to be that outsider, watching this big extended family revel in the opportunity to share this moment, and enjoy the occasion as a celebration of a life, the life of a lady who spent the entire length of her years living in New Orleans. Living practically in the same neighborhood, in fact, along the Carrollton Avenue corridor, and always a stone’s throw from New Orleans City Park. I learned that Elaine had attended grammar school at St. Anthony, the very property on which we were standing. Elaine attended both St. Mary’s Dominican High School and St. Mary’s Dominican College, where she was the president of her sorority. She later served as the President of the Alumni Association of Dominican College, and sat on the Board of Trustees. In 1987, she was chosen as the Dominican Torchbearer. “She was a New Orleans girl,” said Mark. So was their father, more or less. Sidney Joseph Folse had been born in Thibodaux, Louisiana, but he was living in New Orleans when they met. She served as President of the Women’s Auxiliary of the American Institute of Architects, and participated for many years in planning the Beaux Arts Ball. She was active with her four children in school, church and scouting. Once, she even served, most unsuitably, as a Cub Scout Den Leader! Family members of Elaine Sophie Hilbert Folse, who passed away at the age of 91 on Wednesday, November 26th. On the steps of St. Anthony of Padua Catholic Church in Mid-City. Photo: digital via DSLR, 12/13/2014. “Icons” St. Anthony of Padua Catholic Church, New Orleans, 12/13/2014. Format: digital via DSLR. 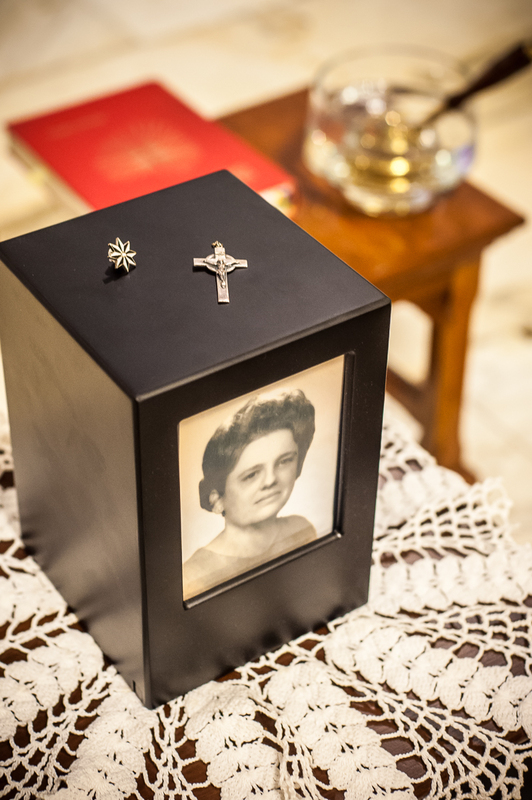 It’s a pretty extraordinary thing getting to know a stranger, via the remembrances of her family, on the day of her earthly send off. 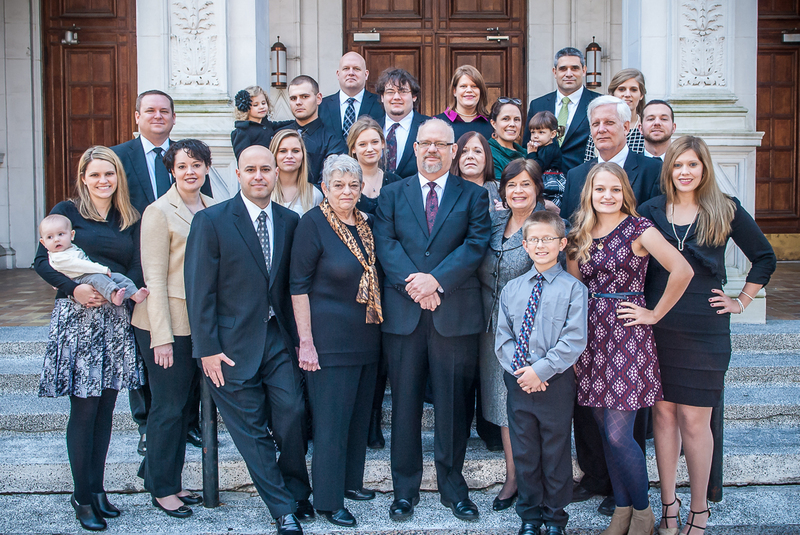 In attendance for the service (and the subjects of my group portrait), besides her three surviving children and Sandra’s husband William Bohne, were nine grandchildren and their spouses, and five great-grandchildren. They had come from Kansas, Texas, Chicago and Missouri, and they were just as pleasant and patient as one could expect, as I adjusted their position on the steps of St. Anthony, and held them there for several minutes while I snapped away. Though many of them live elsewhere and were not born here, they all come back to New Orleans a lot, and the older ones are still connected to the fabric of this neighborhood, where the matriarch held fast for nine whole decades of her life. “She came up here from when Carrollton was a ditch, ” Mark told me. I hadn’t even realized Carrollton had once been a ditch. Memorials may be sent to St. Mary’s Dominican High School, 7701 Walmsley Ave., New Orleans, Louisiana, 70125, Attention: Scholarship Fund. For more of my portrait and wedding photography, you can go here.